Get the most from your online education with these 6 practical tips. Don’t you love the thought of learning something new? I sure do! In fact, my parents used to call me the “eternal student” and joke that I would’ve just kept getting degrees if it wasn’t so expensive. When I signed up for the class, I was thrilled at the prospect of finally learning how to hold a knife properly, how to not unintentionally make sticky rice, and—of course—how to cook a delicious roast. I tore through the first lesson full of excitement (and finally learned how to chop vegetables without chopping my fingertip off), excitedly went through the second, was interested in the third but couldn’t get to it right away, didn’t read the fourth because I hadn’t done the third yet, and…long story short? Within a week, I’d gone from wanna-be Julia Childs to delinquent culinary student. Why did I let learning much-needed cooking skills fall by the wayside? I was full of enthusiasm, and the lessons were just right—short, simple, and full of info I needed. And it wasn’t the class either. What happened is something that often occurs when you take an online class. You get a little behind schedule, life gets in the way, you freak out when the lessons keep popping in your inbox even though you’re days behind. But don’t lose hope! It’s NOT inevitable that you’ll get behind or overwhelmed in your online class, you just need to be proactive about it. To make sure that you don’t fall behind, here are 15 tips and tricks to stay on track, organize and balance your workload, get help when you’re stuck, and maximize your learning. And, if you do find yourself in the same situation as I was (I mean behind in an online class – not making canine-repelling roasts! 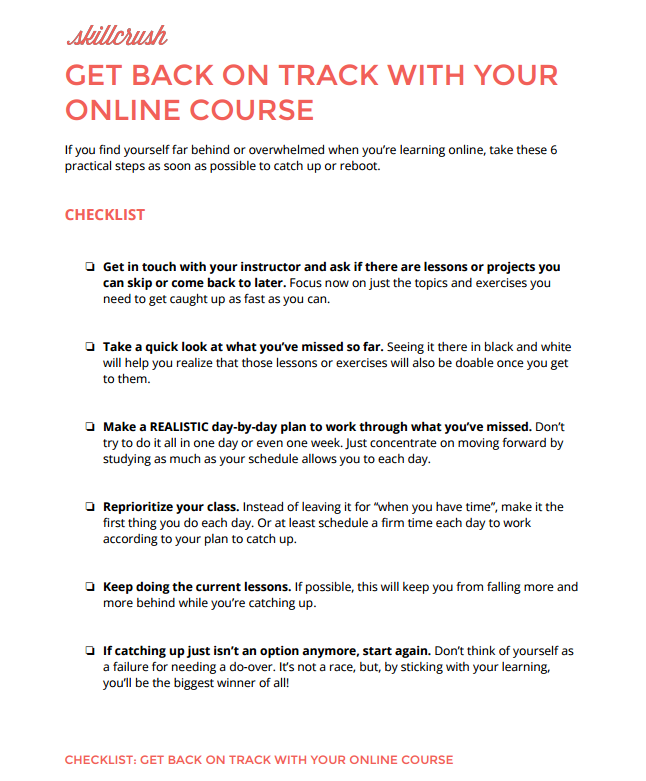 ), just download the FREE Checklist for Getting Back on Track in Your Online Course. 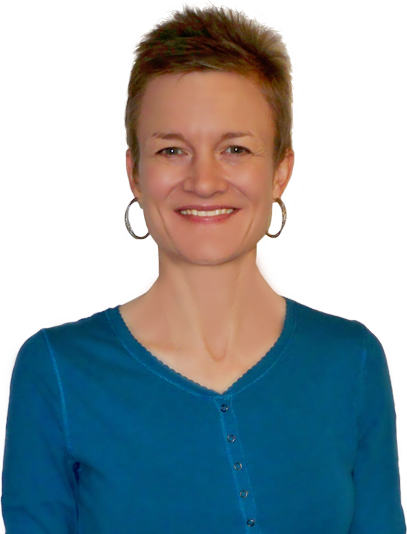 Even if a course isn’t as clearly and carefully scheduled as a Skillcrush Blueprint (! ), you can make a plan for yourself. Break the lessons down into “bite-sized chunks” (15-20 minutes at a time is a doable amount to start with), and put each part in your calendar. Doing a little advance prep can ensure that your class goes as smoothly as possible. That means deciding how you’ll handle your lessons: Will you watch the video, do the reading, and immediately dive into the exercises? Or will you take a look at everything and then go back to do them? Or maybe you’ll start each day by reviewing the lesson before. It’s up to you to choose the workflow that works best for you. And don’t forget to set up your physical environment for studying too. Install the software you need, find the perfect playlist, make a cup of your favorite tea, and get down to learning! 3. Figure out how you learn best. Once you have your ideal environment set up, think about when you’re at your best. If you’re a morning person, plan to study first thing each day. If you have a family to get out the door before 8a.m., think about a lunch-time learning session. And focus on the techniques that you know suit you. Play the videos repeatedly if you learn by listening. Read the articles several times if you’re a visual learner. Do the exercises more than once if you’re a hands-on kind of person. To help the course mean more to you than just a list of lessons checked off, you should also think of some specific outcomes you’re personally looking for. That could be finally mastering jQuery so you can add cool effects to websites you’ve been working on. Or it could be getting your head around GitHub because you need it for jobs you’re planning to apply for. You can also push your learning to the next level by doing projects outside the scope of your class. You could use the HTML and CSS you learn to impress your boss with a brand-new email template for your montly company newsletter. Or you could help your best friend who’s a brilliant blogger by setting up a WordPress site that will make her writing look as good as it reads. 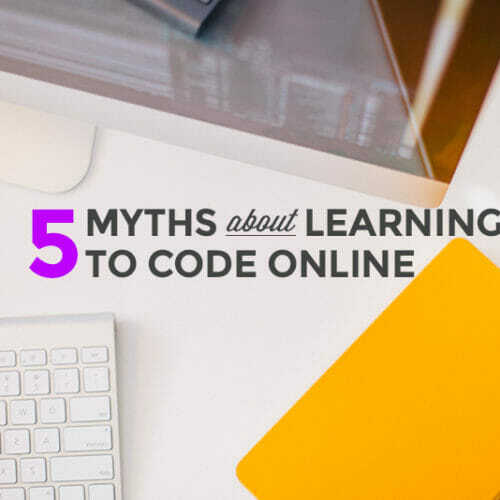 Besides having your own reasons for learning and special projects to work on, you can get even more out of your online class by doing more than the bare minimum—a LOT more. Instead of just getting down the basics of HTML and CSS, really dig in and learn the latest and greatest of the standards with HTML5 and CSS3. 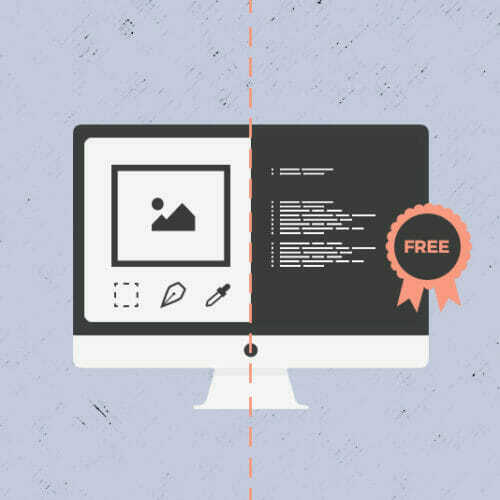 Go past understanding Photoshop basics, and spend your own time making yourself a graphics guru. 6. Engage in the community. Since you aren’t physically in the same location as your instructors and fellow students, you might need to take some extra steps to keep from feeling lonely or isolated. If your course has an online community like the special ones on Mightybell that Skillcrush students have access to, be sure to become a part of it. You’ll soon realize that you’re far from alone and that there are all kinds of amazing people who understand exactly your situation and can give you the help you need. And, even if you don’t have any particular questions or problems, you’ll find plenty of resources, tips, and like-minded people—all of which will enrich your learning experience. And if you need face-to-face interaction, sign up for a local tech meetup. 7. Tell someone in your life. Studying online doesn’t mean that you can’t bring your lessons into your “real life”. One way to really benefit from your class is to become study buddies with a classmate. You can hold each other accountable for keeping up with the lessons as well as help each other with feedback and questions. You can also share what you’re learning with people outside your course. Professional developers do this using a technique called the “rubber ducky method.” In other words, when you have a tough problem, find someone else to explain it to. And, in this case, even a rubber ducky can serve as your listener. Or you can ask your best friend, your mom, or even one of your kids to lend an ear every now and then. You’ll learn a lot when you have to clarify tech concepts to people totally outside the industry. And your loved ones will understand that part of your life that much better. 8. Keep records of what you’ve learned. Many online classes, like Skillcrush, offer a built-in system for submitting work and keeping track of which lessons you’ve completed. You should definitely take advantage of the tools you’re given, but you can also go beyond that. Just jotting down a note (on paper or on your phone, for example) about what you learned that day can help you to solidify information in your own mind or at least appreciate your progress. Acquiring any new skill takes at least some time, and setting a foundation for learning a whole new set of skills especially requires some investment. So don’t be concerned if you don’t fully understand a new concept or when your code doesn’t run the first time. Or the second time. Or the third time. Yep, just like your mom told you, “If you don’t succeed….” Well, you know the rest! When you accept that you’ll need to have the developer mindset of “strapping in” to get the job done, you won’t be phased by the amount of patience and perseverance demanded now and then. Keep at it, and it will pay off. And think how proud of your grit and determination you’ll be! 10. Look for answers yourself. One of the most important professional skills you can develop is knowing how to help yourself. Hopefully you’ll have helpful colleagues once you start working in tech, but they’ll have their own work to do, so you won’t be able to run to them else every time you hit a snag. So now’s the time to figure out ways to find answers on your own. Can’t find the answer on your own? You don’t have to give up or suffer in silence. That, after all, is the point of having instructors and fellow students in your online course. Once you’ve exhausted your own tools, you can reach out. BUT here are some guidelines to follow to make sure you get the answer you need as soon as possible—without pushing your luck. Now that you’re an expert at asking, you can also do some answering. Although you’re still learning, you’re sure to know some answers that your fellow students don’t, or at least have constructive feedback or helpful resources to offer them. Just like knowing how to help yourself will be important in your career, so will knowing how to help others and give useful critique. Plus, beyond the karma- and career-building aspect, writing out some explanations or offering up some code solutions will help you double-check your own learning. Yep, the little yellow ducky is popping up again! 13. Focus on the present. The beauty AND the beast of tech is that there’s always something new to learn. New frameworks, new software, new trends. 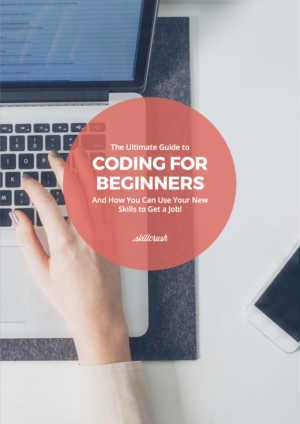 Exciting but also overwhelming… When you’re starting out you can feel like you can’t learn it all fast enough. But you have to remember that every developer rockstar or designer unicorn was in the same place when they started. How did they get the mad, crazy skills you’re dying for? One step at a time. And that’s how you’ll do it too. Follow along with your course lesson by lesson and try not to get concerned about the “big picture”. Build your foundation in one area and then consider if you should go deeper into it or move on to another topic. No one will ever know it all, and you don’t have to either! Just because you’re learning seriously important skills doesn’t mean you have to take yourself too seriously. There’s a whole sub-culture in the tech world that’s all about having a good time, and you can enjoy it and still do lots of learning. Check out the entertaining and informative tech podcasts, get to know other techies at meetups, flex your creative muscles at hackathons, code a game or a funny website just because! And spend some time doing something other than tech too. You won’t forget everything you’re learning. In fact, you actually need some R&R to process your thoughts and re-charge yourself for your next challenge. And living a more well-rounded life will make you a happier, healthier, and more employable tech wiz. If you find yourself burnt out or behind despite these tips, don’t give up! Catching up or restarting is almost always an option, and the FREE download will give you the 6 practical tips to get back on track right away. Did you find this post a little too late? It’s never too late! Download our FREE Checklist for Getting Back on Track in Your Online Class, and get (back) to work!